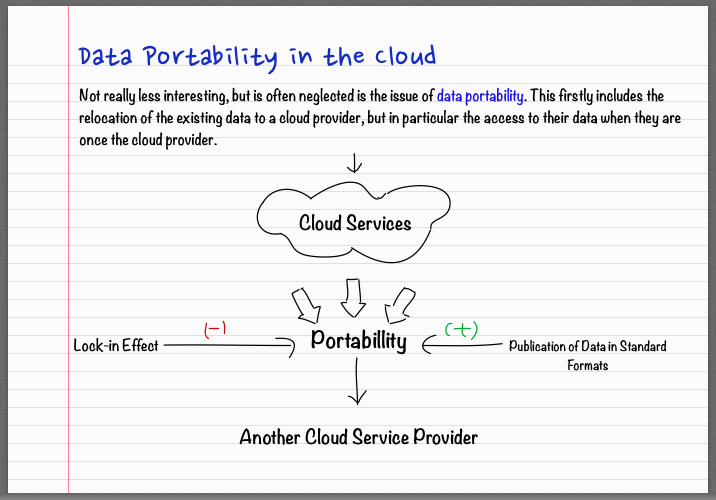 Data Portability in the Cloud is faced as a difficult task when someone want to move own data or even want to get back. With the use of cloud services especially the issue of data storage is hotly debated. Not really less interesting, but is often neglected is the issue of data portability. This firstly includes the relocation of the existing data to a cloud provider, but in particular the access to their data when they are once the cloud provider. It is especially important to have the full access to all the data and metadata such as access rights. That is just necessary if the customer wants to switch to another provider. Because cloud applications but are often optimized for specific usage scenarios, which allow interfaces to access only a portion of the stored data. The concept of data portability refers to the ability of a user to take out their own data when changing a system. Important features are the integrity of the data and the structure and standardization of the data format. A low level of data portability enhances the binding (or lock-in) of a user to an information system, as it brings the difficult to change the system. A so-called lock-in effect occurs when the provider of a product or service makes the process difficult to switch to competing providers to increase binding to their own offerings. Here we also speak of the switching costs for the customer, which can be increased through contractual, pricing or technical measures. Alternatively, other providers can use subsidies to compensate for the switching costs. Users are therefore often not or only through the use of time and money are able to switch to another provider. Economists speak here of a so-called lock-in effect. From an economic perspective, such hurdles act as market barriers that call the law on the plan. While providers with lock-in benefit ostensibly because customers shy away from switching and thus decide to be better tied to the existing services, such effects often scare off potential customers too, the studies were from the industry show such facts now. The economists came to the conclusion that the vendor lock-harm the provider’s own business by the difficulty in data portability, the method which is abused to switch to adopt another cloud service by the new customers. Politics and economics are trying in different ways, with the concept of data portability to improve consumer confidence in cloud services. Thus, the currently discussed Data Protection Regulation, irrespective of region provides a “right to data portability”, which requires the providers to disclose data in standardized formats. Individual providers go here already in advance. Google for instance, combines with Data Liberation Front (dataliberation.org) with tools to export data from Google services. At a broader level, the Data Portability Project also involved in the compilation of open data formats and the development of best practices. The initiative has also connected many companies – these are in addition to Google including Facebook, LinkedIn, Microsoft, and Twitter. How far is the way to a free flow of data is, but portability issues are still seen in the example of groupware solutions in the cloud. At the technical level, cloud offerings such as hosted Microsoft Exchange solutions are initially characterized by a lack of hardware and administration access. Thus, many existing tools and scripts for data migration can not be used. Remaining existing export and API interfaces of the respective solutions, however, has not released by any provider. For some providers of free emails, also sometimes in business Hosted Exchange accounts, such as the e-mail retrieval with the current standard IMAP is disabled. This Article Has Been Shared 242 Times! Key issues for data portability are Contractual arrangements, Access limits and speed restrictions, Availability of suitable interfaces and other points. Cite this article as: Abhishek Ghosh, "Data Portability in the Cloud," in The Customize Windows, September 1, 2013, April 24, 2019, https://thecustomizewindows.com/2013/09/data-portability-in-the-cloud/.